" What you're saying is that Salamander's found a way of harnessing the natural forces of the earth? It's a little difficult to accept! I'm not saying it's impossible, mind you...."
SALAMANDER: I thought he saved my life. BRUCE: No, I mean before that, in Kent's office. SALAMANDER: What are you talking about? BRUCE: Well, I saw you there. SALAMANDER: But I haven't seen Kent in months. BRUCE: Yes, you were with Kent, the Ferrier girl, and those two youngsters. I thought it was so curious I spoke to your number two, Benik, about it. That's really the reason I came to this zone. SALAMANDER: But I tell you. I must get back to research centre. You will come with me. BRUCE: It was you! ..... Or someone like you! 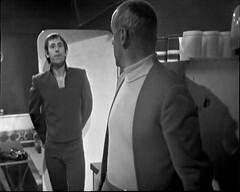 For many years Enemy of the World 3 was the only episode of this story to exist, with the original camera negative for the telerecording being one of two episodes from this season being found in the BBC Film & Video library on Ian Levine's initial visit, the other being Wheel in Space 6. 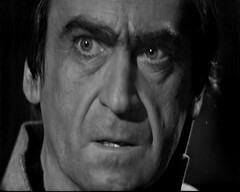 I first encountered it on the Troughton Years VHS and hated it. Very little Doctor, very little of the main villain, no Monsters. Basically "What's this doing on the tape when I could be watching Web of Fear 1 and getting some more Yeti action?". In the context of the rest story I can see it makes sense and has a function. I still don't think it's the greatest example of sixties Doctor Who though. It's just a mess! BRUCE: Captain? Why is Mister Denes being kept in the corridor here? CAPTAIN: It's easier to guard him here. You mean cheaper than building an extra set for a cell? 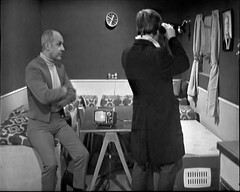 Then only time we see the Doctor he's sitting around in a caravan spying through a pair of binoculars before a character we've not seen elsewhere in the episode arrives to rough up the man the Doctor is with! GRIFFIN: So you reckon you know about cooking? VICTORIA: Yes, I used to do lots at home. GRIFFIN: All right, give me a menu. VICTORIA: Soup. Fish. Meat and pudding. Er. GRIFFIN: Go on. What else? GRIFFIN: Yes, you're a bit too smart for me. All right then, let's have a recipe. VICTORIA: Er, er. Oh, yes! Yes! We used to have a lovely pudding at home, with lots of almonds, eggs, lemon peel, candied peel, oranges, cream and, oh it was lovely! GRIFFIN: You wouldn't know how to make it? VICTORIA: Oh it's quite simple, really. You sort of whoosh it up all together. GRIFFIN: Well, that sounds easy. What's this whoosh-up called, then? GRIFFIN: Oh that's great, just great. Yes, I've got a job for you, all right. Peel those spuds, yeah, now. FARIAH: Is that the best you can do for her? The girl must learn. GRIFFIN: Back at school, are we? Well, I suppose there are worse things. The place could be overrun with rats gnawing holes in the gas pipes so the ovens catch fire and burn the building down. FARIAH: It isn't that bad, Griff. GRIFFIN: Look, I'm only trying to help with the. See? There, you see? This chicken's browning too soon already. It'll be as tough as rubber. GRIFFIN: Now the soup's boiling. Did I put any salt in it? Dinner tonight's going to be national disaster. My mother was right. GRIFFIN: She wanted me to be a dustman. Here, look, do you want to do something useful? GRIFFIN: Well sit down and write out the menus. First course interrupted by bomb explosion. Second course affected by earthquakes. Third course ruined by interference in the kitchen. I'm going out for a walk. It'll probably rain. And that features a guest actor hamming it up as much as possible! VICTORIA: Astrid and Giles Kent were quite right, Salamander is an evil man. I can somehow sense it from all the people here. JAMIE: Aye, he's bad all right. He's had Denes arrested, and he's got this man Fedorin eating out of his hand. VICTORIA: Why should he do that? JAMIE: Remove the honest man and put a weaker man in his place, but somehow have a hold on him. That way Salamander can take over the territory. VICTORIA: Oh, I see. And when everything's in a turmoil because of the earthquakes. JAMIE: Aye, and that's lucky to say the least. VICTORIA: But you don't really believe that Salamander could cause earthquakes, do you? KENT: I'm certain Salamander's causing the earthquakes, Doctor, and I'm sure your friends Jamie and Victoria will tell you just how bad he really is. DOCTOR: But why make earthquakes? KENT: Years ago, Doctor, when one country wanted to invade another it set about attacking the confidence of that country, throwing it into confusion, making it weak. Then it was right for takeover. Now, isn't that exactly what's happening here, only in a different way? DOCTOR: What you're saying is that Salamander's found a way of harnessing the natural forces of the earth. It's a little difficult to accept. I'm not saying it's impossible, mind you. You say it's coming from the Research Station. Salamander's Research Station, eh? KENT: That's what I believe, in spite of a number of reasons. He invented the sunstore, a brilliant advance. He found a way of directing conserved energy to areas starved of sun. DOCTOR: What made you suspicious? KENT: All the money he was spending at the Research Station. The materials involved, the food stores. It didn't make sense. I had all the papers, all the requisition orders. DOCTOR: But that's valuable evidence! KENT: All destroyed, and new ones appeared, and I was made out to be the criminal. All by suggestion, of course. I was discredited. And every accusation I made against Salamander was put down as an attempt to throw suspicion off myself. Like main guest star Bill Kerr. Reg Lye, who plays Griffin the Chef, is another Australian but this time not appearing in the story's main Australian setting! David Nettheim, playing Fedorin, is another Fair Dinkum Aussie though that doesn't come through in either his performance or the background of his character who's meant to be central European! Nettheim's got an Out of the Unknown appearing in the comical season 1 episode The Midas Plague as the Analyst which you can see on Out of the Unknown DVD Set. 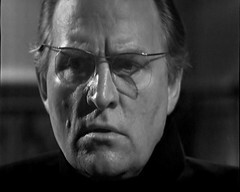 He was also in The Prisoner: The Schizoid Man as the Doctor. We can see his boat race clearly here! 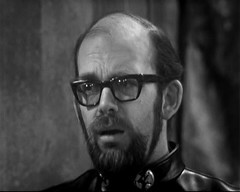 Appearing in the second & third episodes is George Pravda as Denes (pronounced Den-esh). 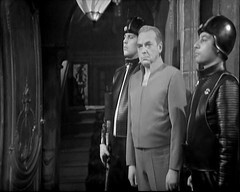 He returns in the Mutants as Jaeger but is famous for his appearance as Castellan Spandrell in the Deadly Assassin. 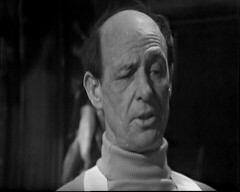 He too had been a Doctor in The Prisoner appearing in the episode A Change of Mind. 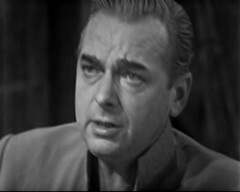 Elsewhere he's Kutze in the James Bond film Thunderball, Prof. Miklos Egri in Doomwatch: Spectre at the Feast, Gen. Alexis Trenkin in Moonbase 3: Castor and Pollux, Gershom in I, Claudius: Some Justice, Hirschfield in The Professionals: First Night and General Borov in Firefox. Guarding Denes in the corridor is Bill Lyons who would later go on to write the Blake's 7 episode Games. Oddly enough the next Doctor Who story, the Web of Fear, features an actor who would go on to write the previous episode of Blake's 7! 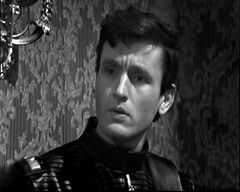 Lyons also has an Out of the Unknown on his acting CV playing a Youth in The Little Black Bag, a third season episode that partially survives. 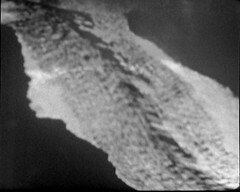 A piece of film familiar to Doctor Who fans pops up in this episode: When Kent is showing the Doctor footage of the Volcanoes erupting a piece of stock footage is used. 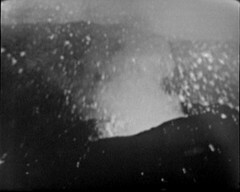 The same piece of film, albeit in colour, later resurfaces in Inferno as the background for the custom story and episode slides seen after the title sequence. So given that it's so bad, why have we still got it? An episode being "good" or "bad" doesn't seem to have any effect on if they were kept or not. 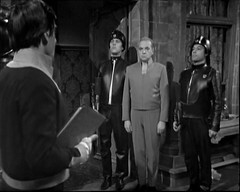 For a long while it was thought that this episode was the first to be broadcast using the 625 line standard but the recent find of earlier episodes of this story have shown that they were recorded on that standard too. I would have happily swapped this for almost any other Troughton episodes and when a second copy of Enemy of the World episode 3 was found in Jos and the missing Web of Fear episode 3 wasn't I could have torn my hair out!